In 1802, J.F. 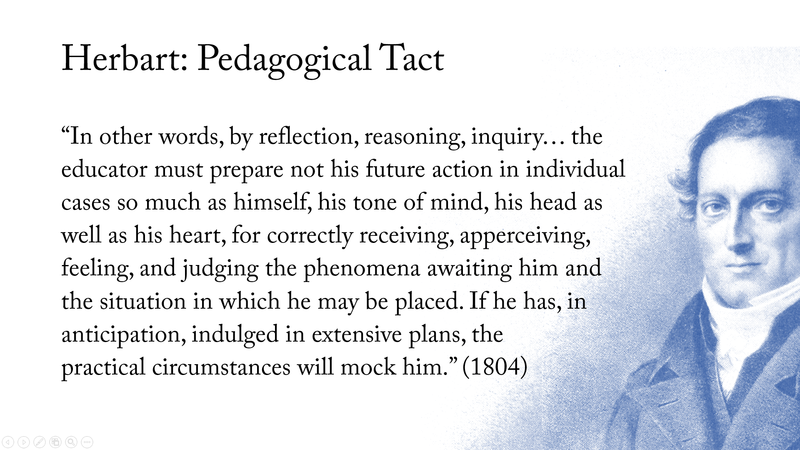 Herbart (1776-1841) gave a brilliant lecture on pedagogical tact, which provides many insights that remain relevant today. Here’s a 1898 translation of Herbart’s lecture, provided courtesy of Google Books. See the whole PowerPoint presentation, which situates Herbart’s discussion of tact in the context of the broader relationship between phenomenology and pedagogy. This entry was posted in Bildung, Pädagogik, Phenomenology, Presentation. Bookmark the permalink. how can I quote this text? However, you are the only one who provides the internet-source to Herbart in the English-speaking realm.